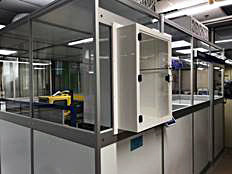 During 2018 Inoplas installed and validated a Class 7 cleanroom complete with a 22 tonne Arburg injection moulding machine to meet the growing demands of customers in medical, electronics and bio-technology industries for injection moulded assemblies produced under strict cleanroom conditions. We have also invested in a range of ancillary equipment to support various assembly and packaging processes to comply with the standards required by ISO13485. Our investment was part funded by a grant arranged for us with fabulous support from the Dorset Growth Hub. Our new facility has created several new jobs and now that we have completed training and validation is available for contract manufacturing and assembly where high level cleanroom standards are required. The room uses positive pressure HEPA air filtration which changes the air up to 90 times per hour and ensures that the density of 5 micron particulates is less than 3,000 per m3 of air. To put that in context, ‘fresh’ air has more than 300,000 particulates per m3.